For those who want to eat delicious rice everyday, this 5kg package (normally lasts for about half a month if ordinary used) is ideal. 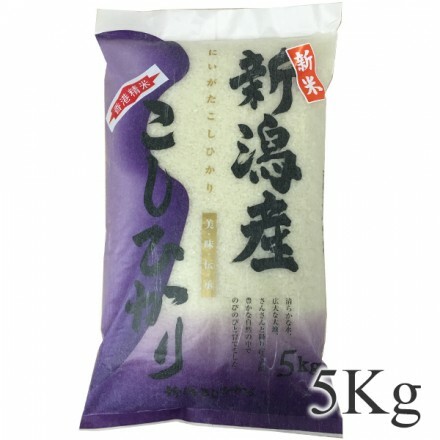 Niigata Koshihikari, the most popular tasty rice! Koshihikari Rice is so delicious that it is produced all over Japan. But the most popular is the one made in Niigata Prefecture. The Shinano River and the Agano River, both run in Niigata Prefecture, bring meltwater from the upper streams, which is rich in mineral, making paddies in Niigata nutritionally perfect for cultivating rice. Koshihikari Rice made in Niigata Prefecture, considered to be the most delicious rice in Japan, is produced from farmers' conviction to "produce the best rice in Japan." Good shiny appearance, fluffiness, sweetness and sticky texture when cooked make this brand harvested in Niigata very popular. When you eat the rice some hours after freshly cooked, like when you bring your lunch from home, it still tastes real good because it does not lose savor and texture even with time. Try yourself this Koshihikari made in Niigata Prefecture, and you will see the difference from the rice you have ever eaten! We would like our customers to enjoy the savor of freshly polished rice; therefore, all our products are normally delivered to you within 2 weeks from the date of polishing. The design of the bag may be changed without notice.